At some point during our Skype classes, Richard Thomas Scott mentioned a conference in California that dealt with representational painting — Odd Nerdrum would be a guest and he would be there too, and I might enjoy it. Really, I had no intention of flying to California, but on a whim I looked it up online and realized it would be the opportunity of a lifetime. And it was. 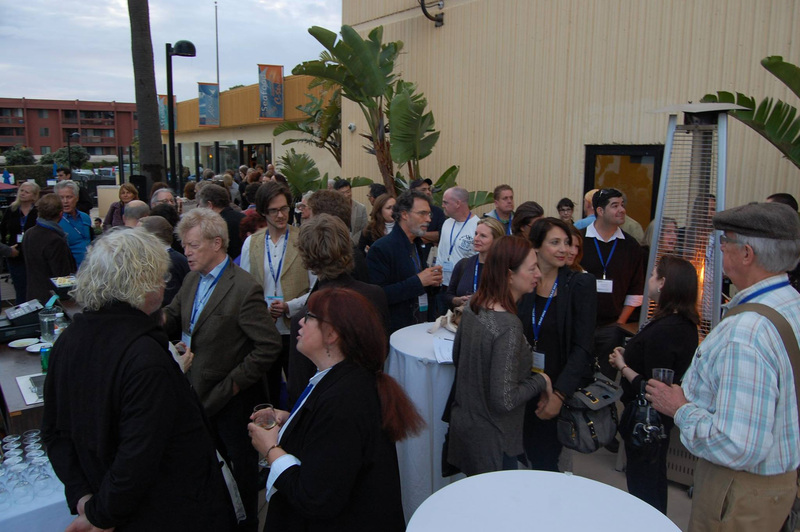 Attending last year’s TRAC, The Representational Art Conference, in Ventura, California was an exhilarating experience. Midway through the conference I tweeted, “Having so much fun I may pass out.” In fact, the whole event, being around so many brilliant and talented people, was so intoxicating I swear I got dizzy — it was like swimming in some heady philosophical/painting champagne soup! And the fun continued after I got home. I discovered the Representational Art Facebook group, and the Cecilia Beaux Forum, and the Post Contemporary group. Every day there are posts about painters, either dead or alive, I have never seen before. I’ve also read a number of excellent blog posts about TRAC, which have led to the discovery of more art blogs — just about every day I bookmark another one to read. As soon as I walked into the hotel I knew I was in over my head. I have worked as an illustrator for over twenty years but am only in the process of learning to paint in oils, and here I was with many of the most well-known and successful painters in the world of portraits, representational painting and atelier teaching. For those outside this world their names might mean little, but for me it was overwhelming. When my husband and I checked in at the hotel desk, right next to us was Odd Nerdrum, hard to miss with his long tousled golden-white hair and clean white painter’s smock. In the hotel lobby I said hi to a young man sketching, and discovered he was a former Nerdrum student. Looking around I recognized Virgil Elliott and Juliette Aristides (she was also a major guest speaker at TRAC), teachers at their own ateliers who had written books about painting — books I’d eagerly gobbled up. For a person trying to learn to paint out in the boonies, these books are lifelines, and I freely admit to being a bit star struck. 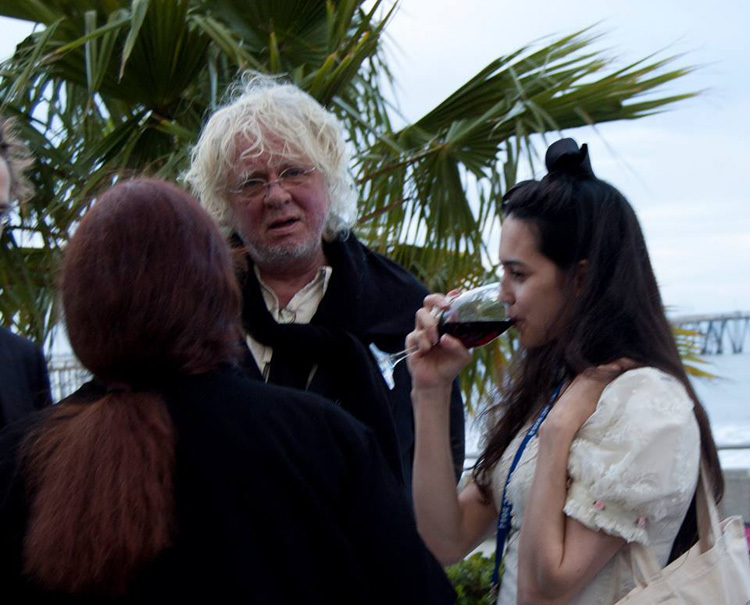 The first evening there was a meet-and-greet on the patio, and there was Nerdrum standing pretty much alone, staring off in a distracted manner with a glass of wine, so I summoned my courage and approached him. I said hello and told him that I had flown across the country just to see him. “I am deeply honored,” he intoned, bowing slightly in a courtly way. Then I tried to tell him that I had read “On Kitsch” and why it had meant so much to me, having most decidedly not been the apple of my abstract-expressionist painting teacher’s eye in college. He nodded sagely but said nothing. I tried to talk about his ideas about timelessness, but ran aground again. At that point I panicked and attempted to excuse myself but that didn’t work either. “We came here to talk, so talk,” he said, not in an unfriendly way. *Crickets. * Mercifully for both of us, we were then joined by a striking young woman who wasn’t wearing a nametag, but Odd greeted her warmly and I soon figured out she was a former student. (It turned out to be the amazing Teresa Oaxaca. She was extremely gracious when I saw her later with her nametag and realized who she was!) But when I turned to her and asked, “You are an artist?” I found I had made a serious error! Odd sternly corrected me: “Painter,” he said very firmly. He is quite serious about his detestation of the word “artist,” and I had committed a faux pas, but I took the Master’s correction in good humor. Photograph by Brittany McGinley, with permission from Michael Pearce and TRAC. A few weeks ago, Michael Pearce, the moderator of the Representational Art Group on Facebook and one of TRAC’s organizers, posted some photos of the conference, and there I was standing next to Nerdrum and Teresa Oaxaca, surely at that very moment! I think Teresa’s trying not to laugh, possibly at the international Clash of Accents going on between us — Odd’s son, Bork, thought I sounded like Forrest Gump, which I cannot completely deny. Here’s another photo showing me as a giddy fangirl, with Roger Scruton, another featured guest, nearby. Photo by Brittany McGinley, with permission from Michael Pearce and TRAC. I will confess my fantasy: it was to have a deep conversation with Odd about his reported early interest in Anthroposophy and the teachings of Rudolf Steiner, but of course that didn’t happen. Years ago, I read many of Steiner’s dense and horribly translated books, filled with mystical notions of spiritual lineage and influence. Nerdrum has often written and spoken of artistic influences from the past which guide him as a painter, and I wondered to what extent, if at all, he has integrated Steiner’s writings into his worldview. Is spiritual lineage merely a metaphor for inspiration or does he intend the meaning in an esoteric sense, as Steiner did? Nerdrum’s work seems to reflect some deep subterranean current that I cannot quite put my finger on, quite apart from technique. I’m still glad I talked to him. Nerdrum has a reputation as being a bit difficult, and some people have gone so far as to call him an out-and-out a**hole. A long time ago, however, I stopped avoiding difficult people and started seeking them out. They are rough, their edges sharp, but that is because you are making real contact, touching the “real them,” and sometimes our true selves are not smooth and silky, but more like sandpaper. Difficult people are alchemical corrosive, but sometimes there is gold in the end. After the cocktail party on the patio, I spent the rest of the week scurrying from event to event, trying desperately to see and hear everything but utterly failing in spite of flat shoes and lots of coffee. But many of the panels have appeared on Youtube and many of the papers I missed are now out in print in Kitsch & Beauty, edited by Michael Pearce. The very first person I met was Gezien Van de Riet, an artist who had flown all the way from the Netherlands. Her work (thank goodness for iPhones and websites!) consists of light-filled woodland landscapes, richly colored in pastels, with such jewel-like clarity that they could almost be scientific illustrations. I think we felt a natural affinity for one another. It was also a real pleasure to meet Elana Hagler (now also resident in the Deep South) and attend her talk on “Apollo and Dionysus in the Representational Painting Family Feud.” I thought I was fairly familiar with most 20th Century painting schools, but when she told me that she was a “Perceptual Painter,” I had to Google it because it was completely new to me. Her exquisite portraits and still life works are carefully observed, every stroke considered and placed with Apollonian reserve, using a deliciously cool palette. These qualities are balanced by a distinct freshness and ease, seen also in her studies and plein air work, work that undoubtedly provides the Dionysian underpinnings for her more finished studio painting. I enjoyed her talk because it helped me understand my own journey as an artist. As a scientific illustrator, I’m just about on the far end of the Apollonian scale, but I’m trying to ease over to the middle in my painting. Monday evening, my husband and I had dinner with Ryan Brooker, the young man whose remarkable self-portrait I had seen years ago when he worked with my son, and he shared a preview of his talk the next day on sacred geometry: “Beyond the Golden Ratio.” He is an undeniably brilliant young man. The next day I attended his talk, where a big crowd shared my enthusiasm and several people encouraged him to write an e-book and make it available. I finally met Richard Thomas Scott, my Skype teacher, and listened to him present his paper, “Truth is only Skin Deep,” in which he spoke movingly about his experience of surviving a high school shooting and how that event fed his desire to make his life and work meaningful. This resonated with me because of similar events in my own life that led me to similar conclusions. His deeply felt talk brought tears to my eyes and I was not the only one. And there were other similar moments during the week. The panel discussion “The Aesthetics of 21st Century Representational Art – (Odd Nerdrum’s Kitsch and Roger Scruton’s Beauty)” sounds pretty intellectual and cold, doesn’t it? But the speakers (I especially remember Julio Reyes, Alan Lawson, and Jan-Ove Tuv) talked about deeply emotional themes: the redemptive power of art, the importance of intention, what we as artists hand on to the next generation. When they spoke of what painting means and should mean and how it relates to their own lives, their words moved me greatly because I knew they understood that art is not a frivolous pursuit, but has meaning for us and for those who come after us. On Tuesday afternoon, Odd Nerdrum and Roger Scruton spoke at length in a panel discussion on “Contemporary Representational Aesthetics.” Nerdrum expressed humor, but also touches of hurt and bitterness in his talk that afternoon, and flashes of genuine anger. “They are not nice people,” he said at one point, referring to the relentless arbiters of PostModern taste. He meant it, and who can blame him? His prison sentence has been reduced to one year, but he will not be allowed to paint in prison as things stand according to Norwegian law. Scruton, on the other hand, as fond as he truly seems of beautiful painting, sees the realist painting world as a niche where painters so inspired should retire without open rebellion against the status quo. He carefully remained aloof from reckless talk of any new movement in painting. And finally, at the show “Resonating Images III,” I got to see two of Nerdrum’s paintings up close. Before the dinner began I looked up, and there walking right by our table was Odd, so close I could see him even without my glasses. Forgetting my shyness, I smiled and just waved hi to him! And he smiled with such a friendly and eager expression, like a happy schoolboy, and waved back at me as if he were glad that I recognized him! Well, right then and there I could understand why his students seem to love him so dearly. Next morning we had to leave early and catch our plane (and miss Juliette Aristides, sadly). At breakfast in the hotel, we noticed Odd and some friends at another table. My husband, Ken, knew that I had brought On Kitsch with me and asked if I wanted him to run upstairs and get it so I could ask Odd and Jan-Ove Tuv for autographs. I said no, partly because I’m shy, partly because I hate to disturb people while they’re eating breakfast, and partly because autographs seem strangely impersonal after the fact. It’s the asking for them that’s real, isn’t it? Then the thought occurred to me of asking Odd and Jan to just hold the book for a minute so I could take it home and keep it as a sort of painting talisman, silly, I know, but in the end I chickened out. Even though Odd had said to me, in his stiff and heavy Norwegian accent, I came here to talk, so talk. But perhaps the little moment at the banquet was enough.